【艺基金-闫博绘画作品展】 - 【第二展厅】 - 【艺术部落】 - 中国当代艺术门户网! 2002 Diploma of masters from Central academy of fine arts. According to Heidegger, a piece of art work is an object first. From this perspective, it has no substantial differences with the other things in the world. For Mi Youren，a painting reveals heart, called Painting of Heart. Therefore, a painting is the impression of heart. The priorities on material and heart are regarded as the two approaches of aesthetics. By either way, there is something to be observed. However, the conflict for the co-existence of the two approaches has been always a controversial issue. The thinking pattern of dichotomy induces intractable mental crack for every individual in modern social life. And there is nowhere to search its origin. While we are intoxicating ourselves in the rational search of the significance of origin, we may have being trapped by ourselves. At the time contemporary painting is dissolved by the methodology and theories of sociology, politics, anthropology and psychology, there are too many tactical questions which attempts to weave brand new net in image making upon their trendy style. Deconstruction and confrontation are their brilliant stand while symbols and concepts are their means to flaunt. Covered by many layers of veils, object is dissembled and heart has nowhere to place. Both the priorities on object and heart are departing from their original aesthetic experiences during the evolvement of art. To break the barrier between the two approaches and integrate one into another becomes impossible. Obviously, Yan Bo is not one of them. He stays away from social criticism and political whoops. At the same time, he rejects the trend of seeking oddity and patching things up. He sets his eyesight on original aesthetic experiences and the complementarities of culture instead. Yan Bo is inspired to approach the art itself through the integration of object and heart and reflect the enlightenment of the time and space in individual life. Standing in front of the new works Guang Yin of Yan Bo, you may find that rational questions are pale and cold, but yet the paintings are true and warm. In his paintings, mineral colours and other mixed material pile up. After being polished, the paintings turn into solid objects with thickness. The spots and lines appear from the background of the paintings. The surfaces of the paintings are fine and smooth. Being polished by hands, the paintings appear naturally mellow and clear as if they are covered by thin enamel. The details in the paintings reveal artless simplicity and depth. The trace of growing and whiling-away and the visual enjoyment as if spiritual jade avoid the works being looked through at a glance. In the way of synaesthesia, the works make people feel like to touch them. The material gains life and the works exceed the constraints of concepts and images. As Yan Bo explained, Guang Yin shares the same pronunciation of time. Time goes through everything and represents the impossibilities and hopes of life. How to reveal the changes of life and illustrate his attitude by the means of art is Yan Bo’s intention. The quiet flat paintings try to capture the time, which passes away in a twinkling. Even though time hides itself in every corner of the paintings, it would appear eventually with the occupation of the physical space and the sensation of heart. So he found the Illuminant Stone and received peace and pleasure during his continuous practice. This explanation sounds farfetched and delusive. However, time and space are isomorphic while heart and object are undetachable. Guang Yin brings us fresh genuine dreamful experience. Yan Bo said：“I wish I can create a kind of material which belongs to the work itself. I wish the work is genuine rather than untrue. I want to find a material which can go through time.” Obviously, the material used in Guang Yin is definite, passionate, firm and mellow. The sensation of it is completely different with the texture of canvas. Time is included in it. Meanwhile, it initiates the counteractive isomorph with time. With continuous efforts, the peaceful and sensitive surface of the paintings is not only a kind of pleasant visual enjoyment, but also conversation of mind. Cheerful and simple life, exquisite affection, humorous stories, pleasure of restructuring – Guang Yin opened a broad and relaxing space for us. The bright colours and bold strokes used in his previous works are excluded this time. The painter who used to tell his mind explicitly conceals himself from the works and leaves the audience wandering alone. By replacing canvas with mixed materials, Yan Bo said that he has been working as mason. It took him nearly one month to finish the foundation of one painting. People may question that if this way of creation is still in the scope of art. The doubt is simply because of the inadequate understanding on the concepts of water ink painting and oil painting. The question itself ignores the freedom and possibilities of the ways of creation. There are two reasons for Yan Bo to introduce mixed material to his painting. One is for his infatuation with the tactile sensation and texture of material. The other one is due to his self-examination on human, material, culture, time and space. Paper and silk used by Chinese paintings are extracted from natural products. The sensitive, transparent and fragile nature of paper and silk produces unique spiritual Chinese aesthetics together with hair pen and ink. Once the pen leaves a mark on it, it is not allowed to do any correction. It is difficult to master just as time slipping along. However, the canvas used in western painting is merely a carrier of images after the completion of creation. It hardly can initiate interaction with the creator. Therefore, it remains independent as object itself and appears to be the occupant of space. Yan Bo uses the mineral material as the foundation. The natural and mellow nature of the mineral material participates in the paintings like ancient paper and silk. It increases the volume of the paintings along with the integration of mind and spirit. The usage of material practiced by Yan Bo is obviously influenced by traditional study on the phenomenon of nature. Since Zhuangzi proposed the Equality of Things, Chinese traditional culture always emphasizes the integration of nature and human. It is believed that things in the world are all different from each other, but at the same time, equal. Based on this theory, Confucian philosophers in Song and Ming Dynasty proposed the methods of nature studying. They suggested that every spirit has its understanding and everything in the world has its own reason. People at ancient times derived the principles and theories from nature studying and generalized them as common rational knowledge. This is an approach of affording wide views in a small confined space. With long-lasting efforts, nature and human would reach the harmonization eventually. Both inner and external sides of things can be fully understood and our spirits turn to be explicit. Nevertheless, the ultimate goal of the study on nature is to prove common rules and moral conscience. As the carrier of philosophy and knowledge, the functions and characteristics of the material itself which is opposite to metaphysics are under-emphasised. So-called “To place more emphasis on Tao, the method, than the things” is a clear evidence. However, Yan Bo’s approach of nature studying realises the integration of subject and object and the inter-reflection of time and space. Along with the reveal of perceiver’s spirit, Yan Bo intends to let the life of the material itself emerge so that people can observe it, touch it and feel it. If it is merely to full the perfection of material itself, that is more like the case of a rough jade which needs to be carved. The solid dimension may even look clumsy. How to transform presence to absence? How to form the image which can integrate with the material? Certainly, Yan Bo is not mason. After the Illuminate Stone, he tries to explore the substance of life by the wise approach of Oriental Minimalism. The superficial uproar and sophistication resolve into silence and simplicity. The plain images and concrete intangibility reflect the origin of life and go beyond of it. Comparing with the passion revealed in When See the Beautiful, Guang Yin is calm and implicit. Its aesthetic difference is like the difference between cocktail and tea. Life is full of different flavours. Yan Bo observes it, enjoys it and lifts it. He said: “I like painting things happened in my life and things moved me, especially those experiences when I was young. A lot of interesting first times of mine happened before I was a teenager. I was surrounded by carefree pleasure of love and being loved. This pleasure nurtures my sensitivity on people and things.” Love is his fundamental attitude towards life. If say When See the Beautiful is the torrid passion at youth time and the power to express the emotions straightforward, Guang Yin tries to experience the quality of an interesting life in an implicit approach. Yet the love in it is simple and rich. The transformation is natural and sincere. “Now I stepped into another stage of my life. I’ve got a daughter now. I understand life better. As a result, I feel my relationship with life become simple.” Yan Bo said so. Because of the simplicity, the angle and method of observance change. The love in life possesses more internal strength. It is like a self-sufficient mid-aged man who still has his childlike innocence. It is undeniable that Yan Bo’s life is wise. He doesn’t avoid pains and unhappiness. But he always tries to face it with positive and loving attitude. He explores the beauty in daily life. Therefore, he breaks through the boundary between time and space, spirit and subject, but also the fetters of life. Perhaps we would be surprised by the simple picture of life drawn in Guang Yin. But that is the innocent strength delivered by the wisdom of life. Behind it, it is the accretion of affection and freedom of mind. Unbearable heaviness of life, so is art. Yan Bo understands it very well. Comparing with his previous works, the contrast and differences of the elements for visual expression has been reduced to minimum. But the image language remains coherent, same as his way of taking the views – truncation, close distance and enlargement. The observing angle is also flexible. With such photogenic sensation in short distance, we can feel the breath of life. In the paintings, Yan Bo neither intends to build up the dimension, nor to have an emotional expression. All colours, dimensions and shades for concrete objects are eliminated. The paintings are formed by essential elements – spots, lines and refined colours. With the simple but well-conceived structure of spots and lines, some blank spaces are created. These blank spaces then induce artful interaction with the edges of the paintings. They are like children’s hairs, the spread quilt and curvy corner of walls. The paintings of Guang Yin series form the Poetic Space together with Illuminate Stones. The spirit of materials are revealed and lifted. They not only need to be observed, but also to be touched and felt. 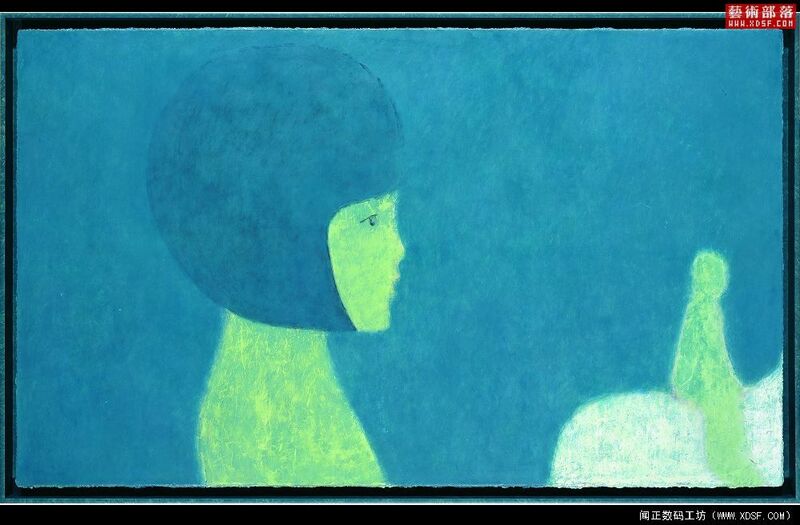 In Yan Bo’s paintings, life is like polished foundation of paintings and full of exquisite texture and charms of trace. He is building another kind of quality of being alive with continuous efforts. The enlightenment of life breaks through the eternal dilemma of time and space at this moment. For many people, Yan Bo’s practice on material shows him as materialistic, yet his study on nature is obviously influenced by traditional Chinese culture of mind. But when we understand the origin, there is no impassable gulf between being materialistic and being idealistic. Heidegger confirmed the nature of art work as object first. At the same time, he pointed out that “Where the temple stands is the birthplace of truth. It doesn’t mean that this place presents or reproduces things correctly. But the existing things are entirely off covered and remain staying there.” Art is to reveal the essential existence after eliminating the unnecessary parts. Yan Bo has chosen and found his own material and matched it with his value about life. In the state of neglecting both object and being, the object is lifted and the origin is revealed. The true way leading to art essence is opened up since then. GMT+8, 2019-4-24 02:57 , Processed in 0.117270 second(s), 21 queries .